Yes, it’s a huge diesel estate on EngageSportMode. It’s also one of the best cars we’ve driven this year, and we’re not ashamed to admit it. When we recently wrote about Volvo’s new electrification strategy, we mentioned how we’d been somewhat seduced by an experience with their product range. This particular V90 is the one which lured us in, and we’re still pining for it now to be honest. But why? Well, the way it looks for a start. 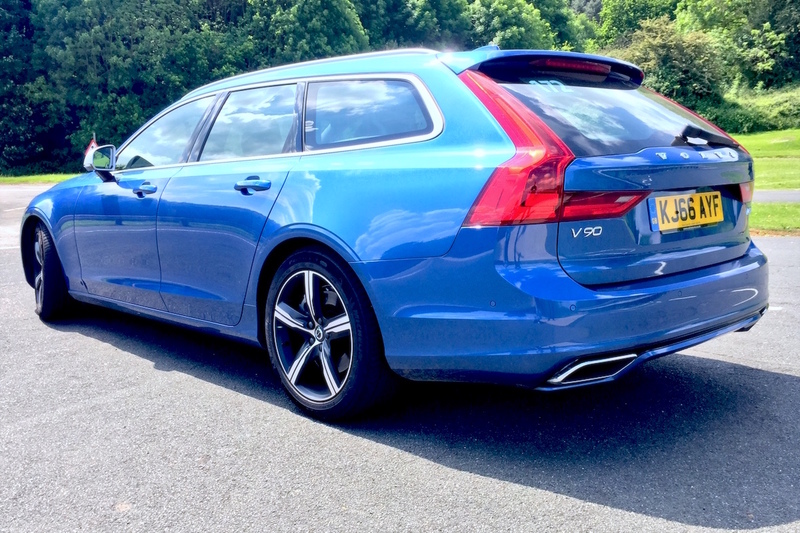 For a giant station wagon, the V90 is a genuinely beautiful thing. Volvo’s new corporate style certainly helps, with distinctive grille and headlights much of the appeal. 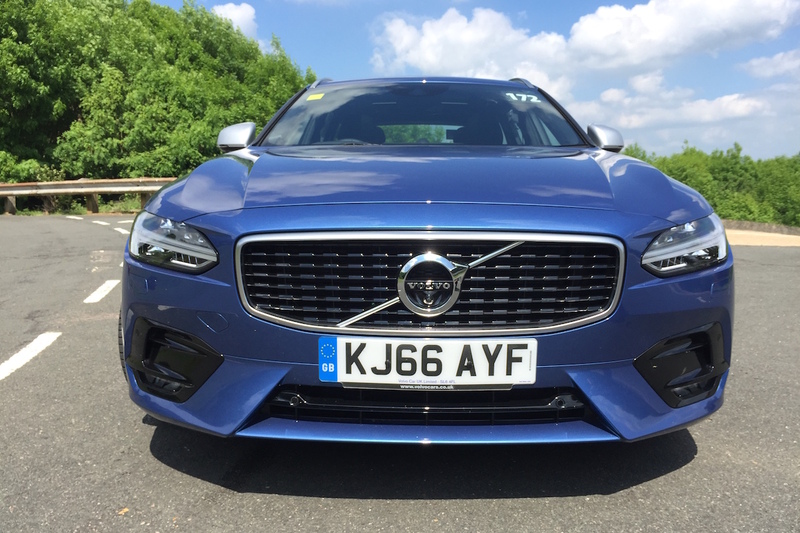 R-Design specification adds a different front-end, with a unique bumper featuring integrated fog lights but, to be honest, the V90 actually works best in standard trim. 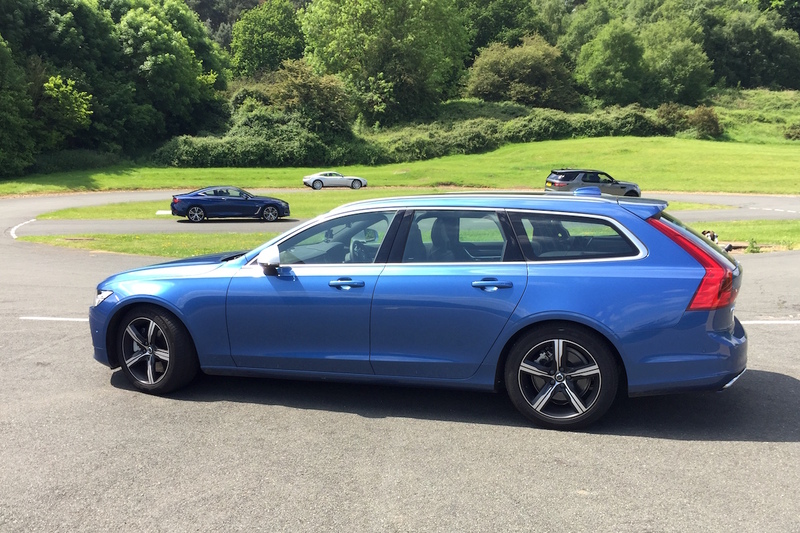 The pointed estate rear is far more successful than the truncated S90 saloon, and also creates a distinctive side profile. 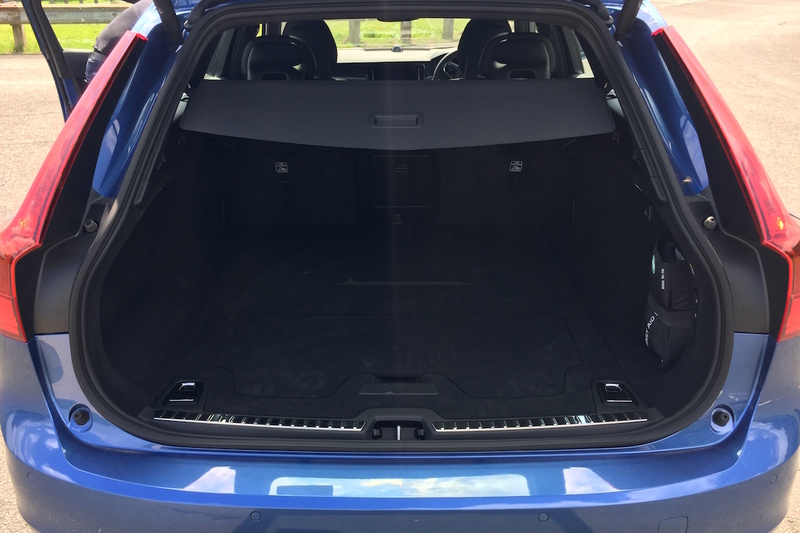 It might sound sacrilegious to ESM’s principles, but performance is not the big deal with the V90. 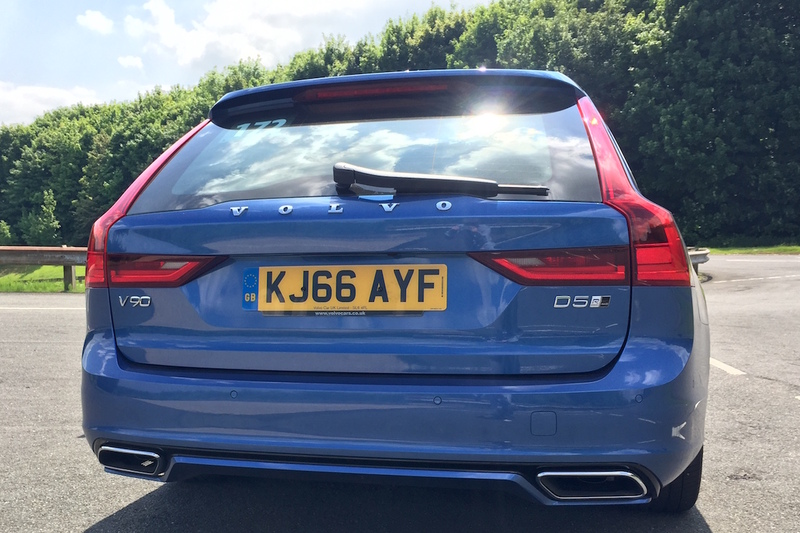 Sure we’d like to try a Polestar-enhanced version at some point, but the experience of driving the D5 PowerPulse four-cylinder diesel is one of effortless progress. A standard eight-speed automatic gearbox, without steering wheel-mounted paddles, is efficient and refined and the AWD system is there to keep things under control. A power output of 235hp, and peak torque from the twin-turbo engine of 355lb-ft, are matched with a kerb weight of over 1,800kg. The result is 0-62mph in 7.2 seconds, with a top speed of 145mph, but focussing on that misses the point somewhat. Driving it made us think more of a big American station wagon from the 1960s, cruising along on a wave of torque. The clever PowerPulse system stores compressed air in a boot-mounted tank, and uses it to spin the turbochargers up faster, reducing lag. 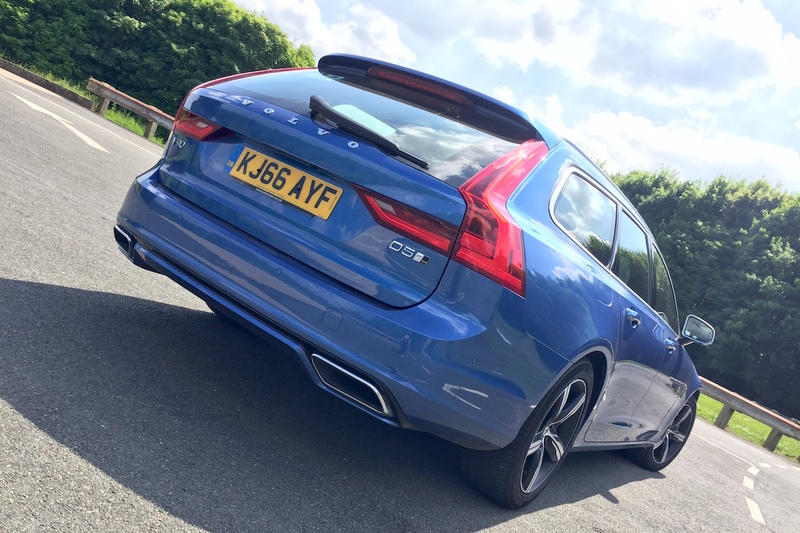 So whilst it might lack the noise of a big V8, the V90 D5 at least has the mid-range punch. R-Design specification delivers suspension lowered by 15mm and with stiffer dampers. Whilst you’ll never truly forget the sheer size of what you’re driving, it does make the V90 feel far more responsive that you would imagine. 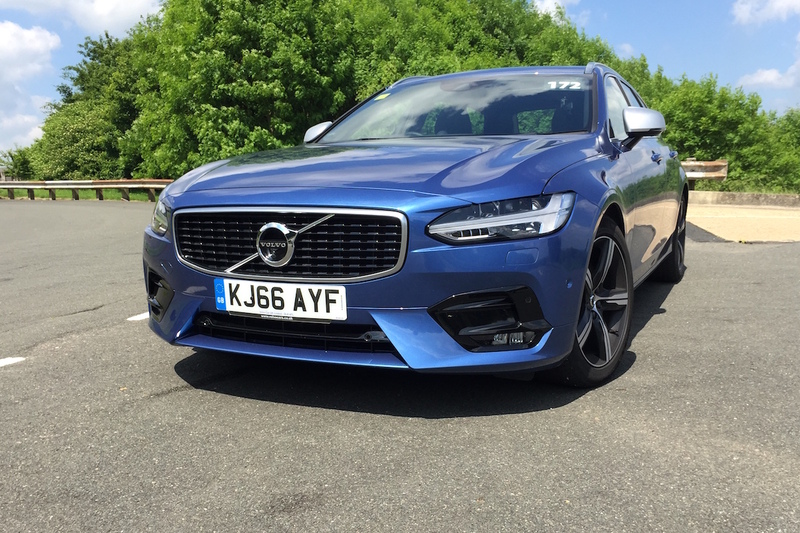 The ride avoids the rock-hard Audi S Line interpretation of sporty, and retains the feeling you could cover long distances in the V90 and not feel exhausted at the end of it. In fact, the overall driving experience is one which leaves you untroubled and unstressed. To trot out the clichés, driving the V90 creates the feeling of being isolated from the madness of the world around you. It’s the Swedish cabin in the woods, but with a touchscreen multimedia system and a faster slightly 0-62mph time. The interior is genuinely brilliant and, once you master the central touchscreen which controls everything from climate control to Spotify, easy to live with. R-Design trim means black seats and black headlining and, to break one of our rules again, we’re not convinced it’s the best choice. Lighter leather would further the Scandinavian ambience, but we’ll stop short of contemplating wood trim, honest. 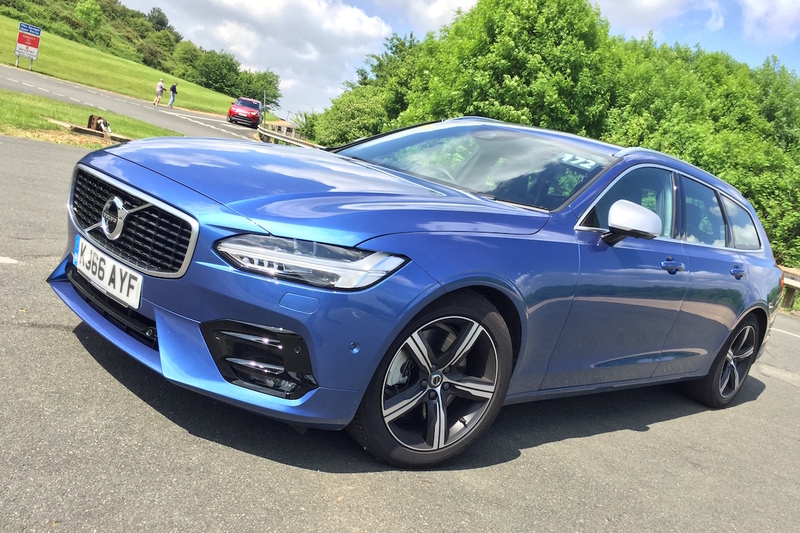 The V90 isn’t cheap, with prices for the D5 PowerPulse R-Design beginning at £44,865. Start to add option packages and premium metallic paint, and a bill for £50,000 is not unforeseeable. But it’s worth it – truly worth it. Under Geely, Volvo has created a genuine premium brand as an alternative to the obvious German choices. Think of this as the motoring equivalent of a 27” Apple iMac. Yes, it might be costly, and take a little bit of adjusting to, but when you see what it’s capable of you’ll question why you stuck with the default option for so long.